Where’s the Beef Mr. Trump? Donald Trump can boast about his juicy steaks all he wants but when it comes to substance and policy…where’s the beef? The Republican front runner is plainly just more sizzle than steak. There’s just too much at steak here to empower this wiener. Vintage ad American Meat Institute 1947 All their ads came with the certification of the American Medical Association, confirming meats nutritional value. Vintage Ad American Meat Institute. 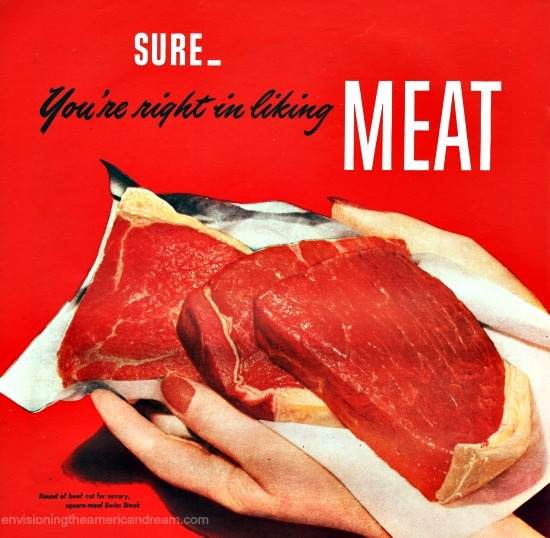 To make certain mid-century Americans included plenty of essential red meat in their diet, The American Meat Institute created a long running ad campaign touting the benefits and magic of meat, assuring the public that yes, you’re right in liking meat! 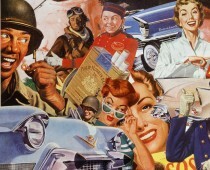 The ads that ran from WWII through the 1950’s drew no distinction in food value or health benefits whether from the lowly hot dog or the king of meat, the sirloin steak. When the boys came marching home from WWII, it wasn’t for some sissy cheesy carrot ring casserole, but for a he-man steak. Our new post war wealth allowed us to buy large chunks of steaks and chops. And binge buying we did, filling up our new deep freezers with all manner of meat. The rest of the world still reeling from the horrors of war, its industrial base shattered, its farmlands untended or blown to bits, could only sit back in amazement and watch. While the allies were busy carving up the post war world, Americans were living high on the hog, carving up their fat larded steaks. And what well marbled, tender meat it was. When hormones were introduced into livestock production after the war, the meat industry was fairly salivating . The manufacturers of diethylstilbestrol, known as DES, hailed the event as the most important moment in the history of food production, right up there with frozen food. And my father couldn’t agree more. Are You Sure You’re Right in Liking Meat? Baby boomers born into this golden age of meat consumption would grow up consuming this sizzling DES deliciousness folks don’t forget. Decades later those unfortunate people who would develop cancer wouldn’t forget either. Although the carcinogenicity of the synthetic DES in test animals was known by 1938 it was approved in 1947 by the USDA. With profits sky-high , it’s no wonder. By the time I was born, meats place in Americas life was as firmly attached to their dinner plates as the plaque lining their arteries would become. Meat…You’re right in liking it because it contains so many things that are good for you…and maybe some things that aren’t. Your post made for an interesting read. And comparing Trump to a slab of beef or steak, you are right about him being more sizzle than steak. is this site sponsored by Hillary Clinton ?she has also done a lot things in the past who are not so nice,the so called Arab Spring she invented was a total disaster we here in Europe are paying the price with all the so called refugees who invaded our countries thanks to this woman’s aspirations to be the next President ! Don’t you think? 😉 I mean after all, Trump is the idealic pillar of family values and all human virtues and principles! Excellent contrast, thanks, there are so many ways to utilize WordPress. Gotta get back to my rudimentary and neglected site.